Flathead Lake trout anglers are working hard to increase their fish totals before the 2018 Fall Fishing Event ends on November 11th. Deadline for turning in fish entries on the 11th is at 3:00. The fish fry for friends and family will begin at that time and awards will begin at 4:00. There are still three weekday days (Tues-Thurs) to fish and three weekend days (Fri-Sun) to increase totals. Entries will continue to be taken until the last day of the event. There is no entry fee-all it takes is one ticket entry to qualify for the lottery drawings. UP to $150,000 in CASH and PRIZES sponsored by the Confederated Salish and Kootenai Tribes will be awarded on the last day. The events are used as a fisheries management tool to reduce numbers of non-native lake trout in Flathead Lake and increase the numbers of native bull trout and westslope cutthroat trout. 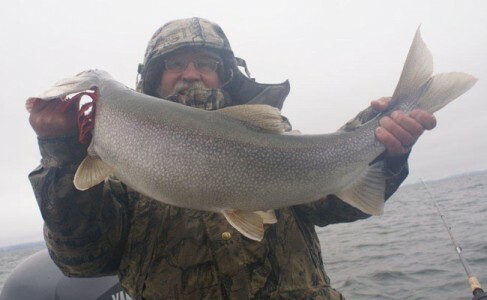 A total of 13,615 lake trout entries have been turned in during this event by one hundred forty five anglers out of the four hundred sixty four entered. Fishing through windy rainy weather the anglers turned in 362-Friday, 543-Saturday, and 357 on Sunday. That compares with 12,200 turned in after this many days in the 2017 Fall Event and 14,687 during 2016 Fall Event. The Confederated Salish and Kootenai Tribes have a special $13 yearly Flathead Lake (south half) Combined Use Fishing Permit available to anyone from in state or out of state. The Top Ten anglers are placed on the last day of competition which is Saturday-Sunday is a separate day with different prizes. The anglers are placed by their best fifteen day average of the event. The anglers catch is counted in by staff and counts given to the official table each day of the event. Leading the anglers is Mike Benson of Lonepine with a total of 932-Friday 55, Saturday 47, and Sunday 32 and a 15 day average of 52.87. Scott Bombard of Missoula is second in total with 740-32,31,15 and 42.93, 3rd is Felix Gauci of Stevensville with 734-2,15,34 and 46.67, 4th David McDaniel of Polson 609-40,44,48 and no average, 5th Terry Krogstad of Kalispell 488-16,45,10 and 28.0, 6th Larry Karper of Florence 485-19,28,13 and 29.33, 7th Sam Cusker of Whitefish with 483-0,0,0 and 32.2, 8th Larry Ashwell of Missoula 466 and 27.07, 9th Richard Kreis of Huson 408 and 24.07, and 10th Julie Perkins of Kalispell with 328 and 19.8. Lady angler Julie Perkins leads the Ladies Category with 328 lake trout entries, 2nd Laurie Kreis of Huson-148, 3rd Gina Schiff of Whitefish-75, 4th Kimberly Mack of Helena with 70, and 5th Debby Sacchi of Thompson Falls with 65. Larry Karper is 1st in the 70 and Over Category (Golden Oldies) with 485, 2nd Larry Ashwell of Missoula with 466, 3rd John Gauci of Florence with 298, 4th Bob Christensen of Missoula with 271, and 5th Bernie Olson of Lakeside with 63. Tripp Bick of Arlee leads the 12 and Under Category with 8, Alison Putzler of Huson is 2nd with 5, Kieran Incashola of St. Ignatius is 3rd with 3, Bailey Piedalue of Charlo is 4th with 2, and tied for 5th is Michael Marlatt-Missoula, Brodie Smith-Kalispell, Ashton Lamberton-Missoula, and Michael Incashola-St. Ignatius. Matt Guckenberg Jr. of Kalispell is 1st in the 13-17 Category with 86, 2nd is Matt Kreis of Huson with 27, and 3rd is Madisyn Lugibihl of Missoula with 5. There is still a $10,000 tagged lake trout lurking out there in the lake. He has 3-$5,000, 5-$1,000 and over 6,000-$500-$100 partners who are all on a most wanted lake trout list. Turning in $200 tagged lake trout over the past week were Scott Bombard and Dave Hoback of Arlee. One hundred dollar winners were Julie Perkins, Mike Benson, Scott Bombard, Larry Karper, Laurie Kreis, Ken Rickert of Thompson Falls, and Missoula anglers Terry Thomas, Mark McMillin, and Dan Schriver. The adipose fin on these lake trout has been clipped. The lake trout are scanned when brought in. The scanned number is then looked up for the amount associated with it. The third and last day of Bucket of Fish competition was won by Mike Benson with a four fish bucket at 24.6 pounds, Kreis boat 2nd with 23.4, 3rd Sacchi boat with 17.4, Scott Bombard 4th 16.9, and Randy Hovet of Charlo 5th with 16.3. Felix Gauci of Stevensville still has the leading smallest lake trout entered at 119mm (4.5”) and 137mm (5.5”). Smallest lake trout and largest competition ends on Saturday at the conclusion of the fishing day. There has been no large lake trout entry. Largest has to be over 36” and over 24 pounds. Weekend drawings-drawn by staff at the end of Sundays fishing and given to official table- of $100 were won by Julie Perkins, Debby Sacchi, Tyll Rogers, and Mike Benson X 2. The last day November 11th lottery prizes drawn from just the last day tickets will be drawn for $200, $150, and $100. Heaviest fish under 30” prizes are $200 and $100. Tagged fish and bonus amounts also count on the last day. For more information about the event go to www.mackdays.com or telephone 406-883-2888 ex. 7294 or 7282. Lake trout that are donated must be kept on ice, not just water in a live well. Layer the ice and the fish. If you use frozen bottles of ice, there needs to be several bottles, and they should be dispersed throughout the cooler. We have ice available at Blue Bay if needed. We will not accept fish that have not been kept on ice.